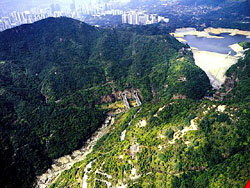 Kam Shan Country Park was designated on 24 June 1977. It occupies 339 hectares and is located in Shatin District, north to Kowloon. The Country Park is set mainly in reservoir catchment areas, it is one of Hong Kong's first country parks. 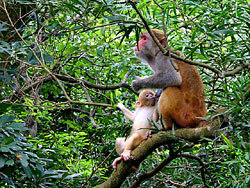 Kam Shan is famous for its macaques. These animals can be found across the park. Smugglers' Pass was part of the Gin Drinker's Line. This key military position had a network of trenches and bunkers interconnected by underground tunnels. Some of these facilities, particularly the Smugglers' Ridge Defense Line bunkers built in the mid 1930's, are substantially intact today. Embracing some 70 years of history, these wartime relics are well worth seeing. Despite its small size, Kam Shan Country Park is home to 4 reservoirs : Kowloon Reservoir (completed in 1910), the first reservoir built in the New Territories; Shek Lei Pui Reservoir (completed in 1925); Kowloon Reception Reservoir (completed in 1926) and Kowloon Byewash Reservoir (completed in 1931). One of the icons of Kam Shan Country Park is a long and narrow stretch of low ridge that extends all the way to Shing Mun Valley. This line of gentle slopes links the small Kam Shan Valley with the larger Shing Mun Valley in the north. To the south of the ridge, eroded badlands mark the landscape. In the poor gravelly soil, dwarf pines that manage to take root brave the elements. On the top of the two denuded peaks, your gaze reaches deep into Shing Mun Valley, and the sylvan peaks and hill pass beyond. The large area of wartime ruins in the northern part of the park is major attractions. Most of the military facilities are well preserved. Although overgrown with vines and grass, the blemishes of war can still be seen today. During WWII, in preparation for the Japanese invasion, defending British troops dug air raid shelters, bunkers and trenches in the region. A 18-mile defense line, the Gin Drinker's Line was deployed. This defense line is that all underground tunnels connecting the bunkers are named after famous London streets. Smugglers' Pass is the New Territories' main route to South Kowloon. Given this geographical significance, the forts along the pass are key defense strongholds. Most of the forts were destroyed during the war. Bullet holes on derelict structures are the only remainders of the bloody battles that once rocked these hills. The war relics in Golden Hill are difficult to reach while Shing Mun Redoubt is relatively intact and accessible at MacLehose Section 6 at Shing Mun Country Park towards the direction to Kam Shan Country Park. 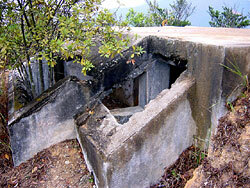 The war relics including trenches, tunnels and pillboxes could be seen along the trail. Positioned close to the urban district, Kam Shan Country Park is served by an extensive public transport network. It is a popular destination for morning and leisure walkers, while at weekends and on public holidays it attracts an even greater crowd. Park facilities include barbecue and picnic areas dotted along, Cheung Yuen Roadand Golden Hill Road. Lying north of Kowloon Reservoir, the Kam Shan Family Walk is a short scenic route for the whole family, while the dams of Kowloon Reception Reservoir and Shek Lei Pui Reservoir are skirted by jogging trails designed for sports enthusiasts. 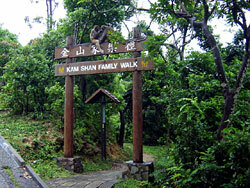 For nature lovers, there is the Kam Shan Tree Walk with its vibrant display of trees and plants. 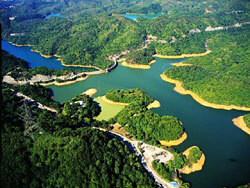 Kam Shan Country Park is very rich in flora, with a great diversity of native species. Most common varieties are Melastoma species, Rose Myrtle (Rhodomyrtus tomentosa), Acronychia (Acronychia pedunculata), Hong Kong Gordonia (Gordonia axillaris), Fragrant Litsea (Litsea cubeba), Red Machilus (Machilus thunbergii), Pop-gun Seed (Bridelia tomentosa) and Ivy Tree (Schefflera heptaphylla), and the rather special Ram-rod Bamboo (Arundinaria hindsii). 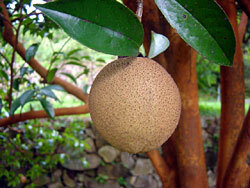 Since the 1950's, exotic flora species have been progressively introduced to Kam Shan Country Park. Examples are Brisbane Box (Lophostemon confertus) and Eucalyptus species from Australia, and the charming Paper-bark Tree (Melaleuca quinquenervia) can be found in abundance along Golden Hill Road near the shooting range. Golden Hill, or Monkey Hill to most locals, is a famous macaques kingdom. Not surprisingly, these macaques are the largest group of mammals in the park. Major species occurring here are Rhesus Macaque (Macaca mulatta) and Longtailed Macaque (Macaca fascicularis). Golden Hill also gives shelter to squirrels and many bird species. 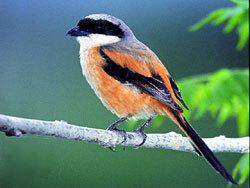 Common winged friends are Black Kite (Milvus migrans), Crested Goshawk (Accipiter trivirgatus), Common Kingfisher (Alcedo atthis), Common Tailorbird (Orthotomus sutorius), Great Coucal (Centropus sinensis), House Swift (Apus affinis) and Rufous-backed Shrike (Lanius schach). The top of Golden Hill and ridges in the west are premier vantage points for appreciating the natural beauty of this grand domain. Looking across the landscape, you see Smugglers' Ridge, Tai Mo Shan, the highest peak of Hong Kong, Needle Hill, Shatin, Lion Rock and Beacon Hill, set against Kowloon Peninsula, western part of the Victoria harbour, Stonecutter's Island and Kwai Chung Container Terminals in the distant background. Section 6 of the MacLehose Trail makes a start at Tai Po Road and meanders up Golden Hill Road past Kowloon Reservoir. Negotiating its way across a series of knolls, giving sights of wartime defense line ruins, and eventually ends at Shing Mun Reservoir. Along this scenic route, you feast your eyes on peaks and crests of different characteristics. Looking at the interesting topography, you can almost visualize how the defending troops manoeuvred in these hills all those decades ago. Section 6 of the Wilson Trail also starts at Tai Po Road. Skirting around the north bank of Kowloon Reservoir, it joins the Kam Shan Family Walk, before following the Smugglers' Ridge uplands to the main dam of Shing Mun Reservoir. Again, vistas along the way are truly captivating.